Although cigars is an expensive passion, cigar storage doesn’t always have to be as pricey. 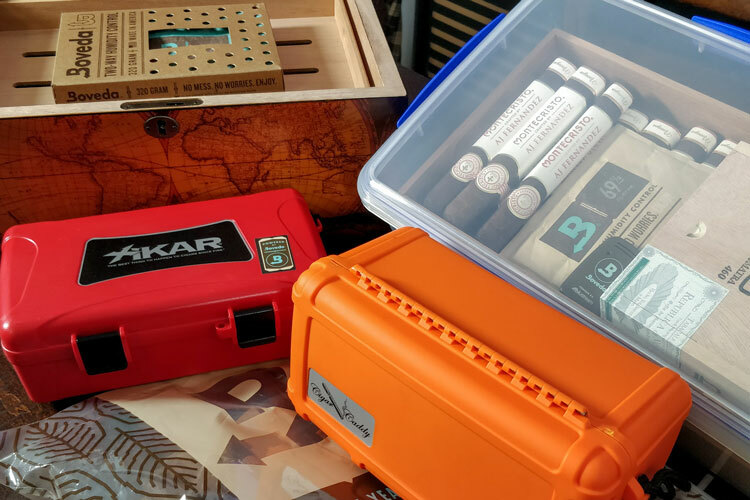 Whether it’s due to budget restrictions or simply the need for cheap storage, it’s not always possible to buy and own a premium quality humidor. What Are The Best Cheap Humidors You Can Buy Online? 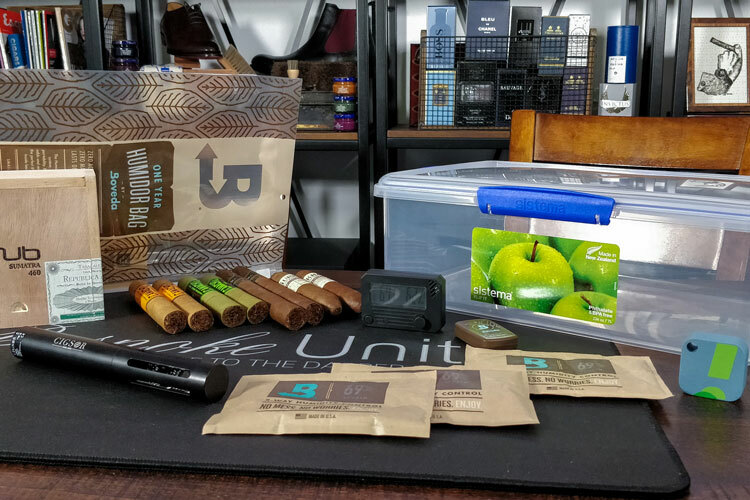 Why Use A Cheap Humidor? Are Cheap Humidors Worth It? When on the move or in need of convenient and reliable yet affordable cigar storage, we always grab a Boveda bag. Their One-Year humidity bags aren’t like regular zip-lock bags as they’re made with barrier lamented plastic for complete moisture retention. Everything from the enclosure to the plastic has been designed solely for cigar storage. 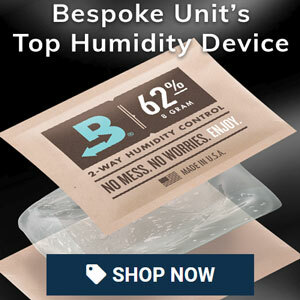 Impressively, the humidity pack is capable of providing a year’s worth of moisture thanks to the airtight seal. If you’re on a budget and need instant storage, simply grab a Boveda bag and you’ll be safe. If you’re looking for a cheap option that offers bulk storage, then you may want to consider building a coolidor. Our first choice for achieving this is with Coleman’s Xtreme series, which is made from BPA-free plastic. It provides and air-tight seal and excellent insulation for ensuring a temperature. With the wheels and handle, it’s also a solid choice if you need to move them around at all. If you’re looking for the most affordable wooden humidor possible, we highly recommend the Megacra leather humidor over the other options. While not as good as some of our other favourite humidors, it offers surprisingly good performance. The base is quite thick and doesn’t seem to allow for any moisture exchange. Meanwhile, the lid offers a good seal and is equipped with a magnetic plate for placing your devices. While the Coleman is a great standalone coolidor that offers portable storage, we’ve recently turned to the Iris USA Remington. This offers true bulk storage for large collections and is also stackable. Therefore, if you need affordable storage that offers as much space as a premium wooden cabinet, this is a fine choice. However, we recommend that you learn how to build a coolidor with our dedicated guide. Tupperdors offer cheap low-maintenance storage like coolidors but on a much smaller scale. If you have a collection of about 25 to 30 cigars, the Sistema 1870 from the Klip-It range is the perfect choice. It’s made from 100% virgin plastic that’s free of BPA and phthalate. As such, you can be confident that your cigars will be kept fresh and safe from any toxic chemicals when ageing. Our final cheap humidor recommendation would be this modern take on the classic cigar jar. Unlike glass jars, this is a lightweight option with an airtight seal. It’s an ideal option for small budgets and can store up to 25 sticks. A single Boveda pack should do the trick and you’re ready to go. However, refrain from keeping it on a shelf in the sun and consider storing it somewhere cool and dark instead. There are many reasons why you may consider using a cheap type of humidor for cigar storage. 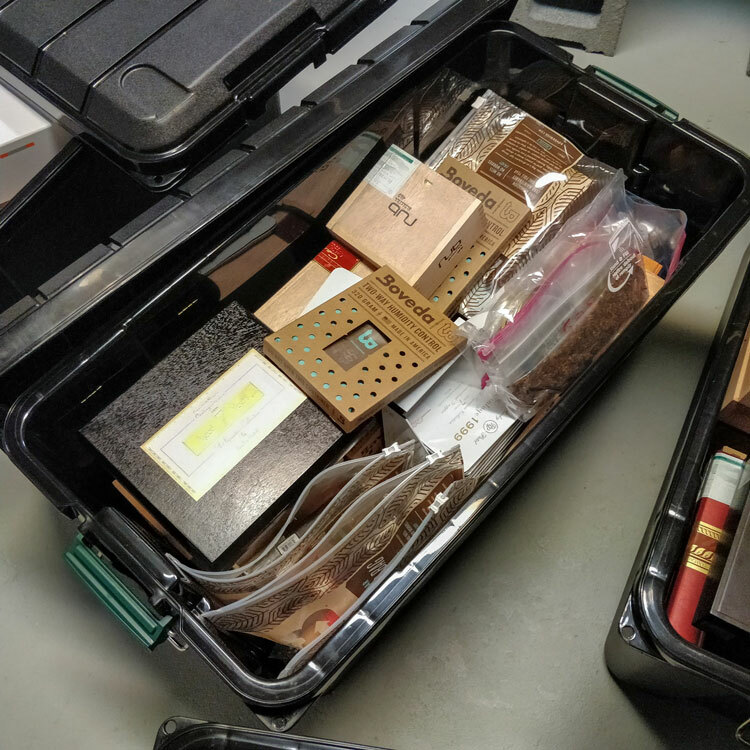 For instance, you may simply be just an occasional cigar smoker with just a few sticks yet conscious that cigars need to be kept in a humidity-controlled environment. It’s not uncommon for people to receive a few cigars as gifts who are then unsure how to properly store them. 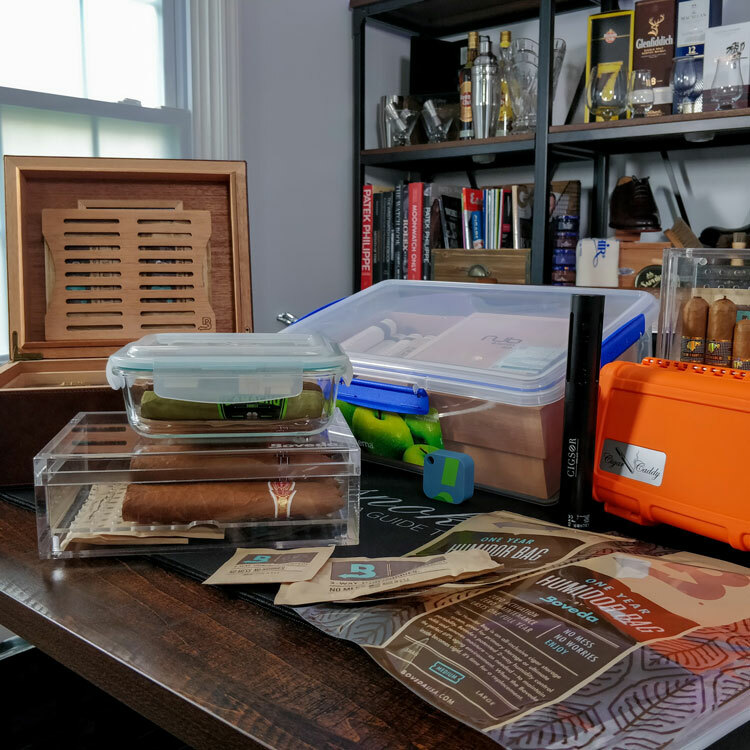 Typically, the first cigars owned by a budding enthusiast may be mistakenly left out in the open or tucked away in a zip-lock bag. We’ve all been there with the regret of wishing we knew then what we know today. 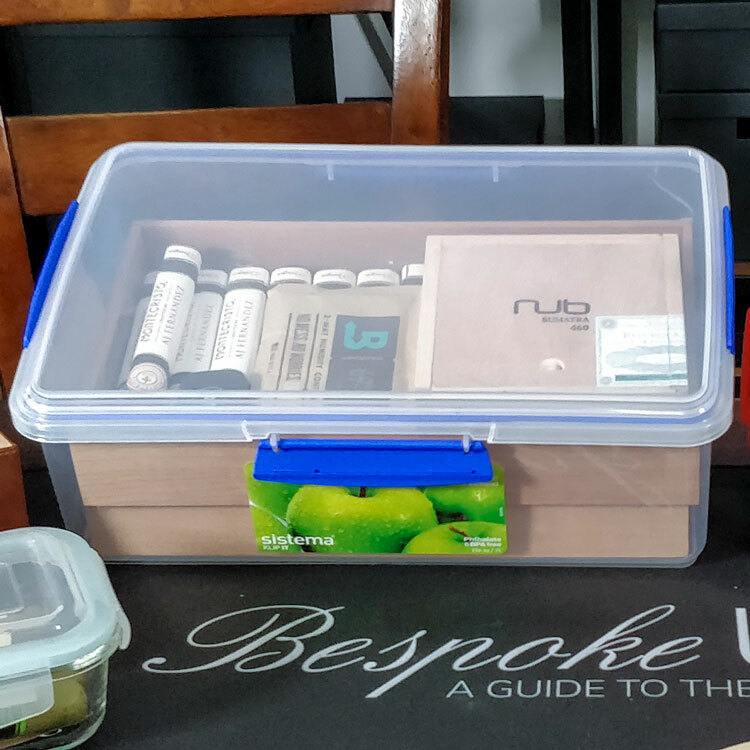 Another typical scenario is that you’re often on the move or travelling and need a quick and easy storage solution to prevent your cigars from drying out. For example, you may have bought cigars from a store that isn’t local for you and need a convenient fix for safe storage. Finally, you may be restricted in terms of budget and need something that’s cheap enough for storing a few cigars. Alternatively, your collection may be expanding and you need a cheap solution for storing large quantities. After all, humidors aren’t cheap and we can’t always afford the best! Usually, we encourage that your storage investment should be proportional to the value of your cigar collection. Given that cigars aren’t cheap either, it’s always wise to protect your investment. Nevertheless, we realise there may be exceptions to this like those listed above. In some cases, cheap humidors tend to offer a reasonable temporary solution to a long-term problem. However, as mentioned above, we believe that you should still invest wisely in storage if you own a collection of cigars. That said, options like the Boveda bag or coolidors do present themselves as quality long-term storage with excellent value for money. With regards to coolidors, they’re often the favourite among serious cigar collectors who need long-term mass storage. 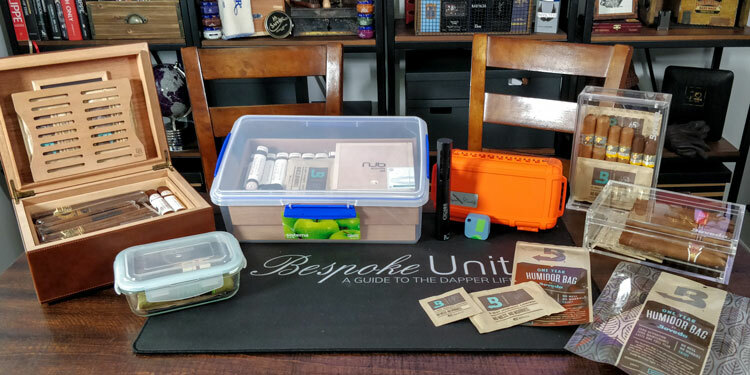 Meanwhile, Boveda bags are a great solution as they’re very cheap yet offer the same performance as some more expensive humidors. Nevertheless, if you are looking for high-quality storage, we would recommend that you investment in a proper humidor for long-term storage. 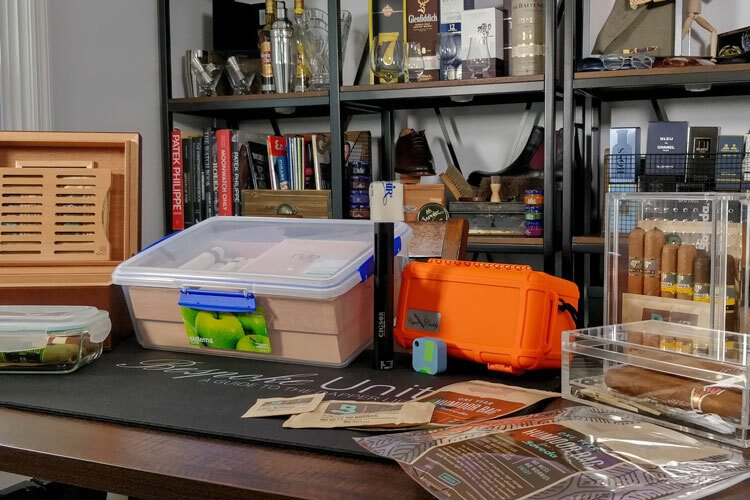 If you want to see the sort of humidors that we recommend, you can start by exploring our guide to the best value humidors to buy online. Ultimately, part of the pleasure of smoking cigars is in taking proper care of them. "Needed an easy fix for temporary storage. Some great cheap options here that helped me find what I needed!"